Enter your best email address to get instant access to the TT MRT and TT MRT Finishers workouts. Plus, you'll get FREE access to the TT MRT workout emails for even more of today's hottest fat burning and muscle building tips. 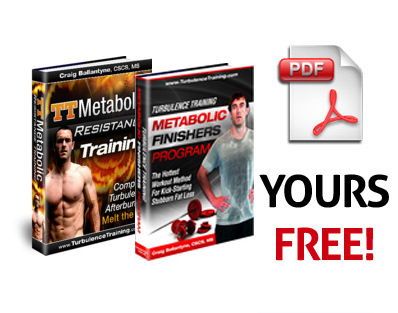 Inside this special offer you’ll get two of Craig Ballantyne’s most popular 4-week Metabolic Resistance Training workouts, the original TT MRT and TT MRT Finishers. 1. It uses a modified version of the heavy metabolic resistance training, allowing you to burn more calories while sitting on the couch after your workout. 2. It uses metabolic resistance conditioning giving you increased fat burning and body sculpting. 3. It uses metabolic finishers that are more effective for fat loss than boring cardio, and way more fun than traditional interval training workouts. all while saving over 90% off the regular price. Now you can get TT MRT 2.0, the highly anticipated follow-up to one of the hottest workouts in the world today PLUS two advanced metabolic workouts, while ALSO getting to ask Craig Ballantyne any fat loss question you want in the exclusive TT Member's Area, while SAVING over 90%. For years men and women all over the world have been getting rapid fat loss results with my trademarked TT Metabolic Resistance Training program. They are the hottest workouts in the world today, and yet despite this widespread acclaim, the legendary MRT system still remains a mystery to some. Essentially, Metabolic Resistance Training is any type of workout where you train with an elevated heart rate while allowing insufficient recovery. Think supersets and circuits. But this alone is not enough to produce the kind of dramatic body transformation that TT users have come to expect with my metabolic workouts. In fact, what separates TT Metabolic Resistance Training from other workouts really all comes down to its 3 core components. I don’t believe in cardio for fat loss… not when you have a shorter, more powerful alternative that’s tried and true. So instead of wasting 45 minutes on a boring elliptical machine, my TT MRT workouts take you through a variation of challenging supersets, trisets, short and long metabolic circuits, and in some cases, my special fat loss annihilator, metabolic finishers. Not only do these plateau busting workouts produce incredible results, they do so while keeping you mentally focused throughout the workout. That’s because I often combine bodyweight, dumbbell, barbell, kettlebell, and TRX exercises within a single program. As I mentioned earlier, TT MRT are the hottest workouts in the world right now, but a lot has changed since TT MRT 1.0 officially debuted. After a year of extreme fat burning experiments performed deep in my secret workout laboratory, research has revealed three new ways to increase the amazing results you can get with Metabolic Resistance Training, including a 4-number exercise tempo, timed sets, muscle squeezing techniques, and even new metabolic exercises. Recent research published in Applied Physiology Nutrition and Metabolism found that we could increase anaerobic energy expenditure and post-exercise oxygen consumption by using longer lifting tempos for a given number of repetitions. In other words, by increasing the time under tension for certain exercises, using a 4-number tempo and/or squeeze techniques, you’re going to feel it directly in your body’s metabolic response and your fat loss results. A 4-day program that includes a quad-pounding Total Body Extension Finisher in workout A, a brutal 10-exercise circuit in workout B, two grueling trisets ahead of a mini leg and arm circuit in workout C, and finishing off with an abs-pounding Core MRT Circuit in workout D.
In TT Muscle Massacre 2K12, Craig Ballantyne’s eeevil twin, the “Braigz”, returns to unleash his vengeance with one of his trademark advanced programs. So nasty is TT Muscle Massacre that NO beginner dare even try it. In fact, one should only attempt this program if they are prepared for a whole new world of torture... one that feels like tacks - and nails  repeatedly poking at your muscles. This metabolic program is the epitome of old school meets new school, only this time it’s laced with pure unadulterated eeevil. Where one workout leaves you limping for days, another is punishing your upper body, and still another is exhausting you both mentally and physically. Yes, TT Metabolic Muscle Massacre is truly eeevil. So eeevil in fact, it needs three e’s. A criminally insane fat loss program has been unleashed, and as you might expect with my trademarked workouts, it includes all the advanced TT metabolic resistance training goodies, including your favorite finishers. With your heart thumping to the beat of chaotic madness in Workout A, the veins on your arms creating a roadmap to Madnessville in Workout B, what better way to turn up the metabolic burn and wrap up an “insane” week than with one of my classic bodyweight 400 circuits. Yes, it’s crazy. Yes, it’s chaotic. But these metabolic workouts are guaranteed to transform your body from head to toe. PS - If you want three of today’s hottest workouts for losing fat and building muscle at the SAME time, while SAVING over 90% off the regular price, then grab this Turbulence Training offer today. PPS - Your results are guaranteed by my 100% money back promise. If you aren't satisfied with your results from these programs, just let us know and you'll be refunded your $7.00 before the end of the 60-day period. 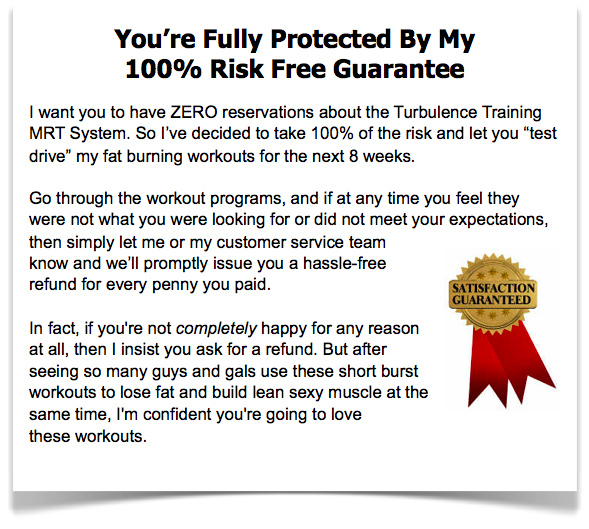 NOTE: Turbulence Training For Fat Loss is a downloadable exercise routine manual. No physical products will be shipped. After you order, you will get INSTANT ACCESS to download the exercise routine manual and all the bonus reports onto your computer. The exercise routine manual format is adobe acrobat PDF, which can be viewed on Mac or PC.